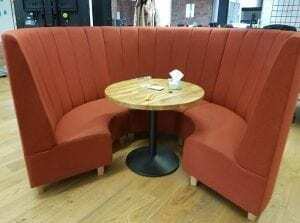 We currently have these sectional meeting pods available in a terrecotta fabric. As well as looking very stylish and contemporary, feeling very comfortable and cosy, they create a more private ambiance for a meeting or a chat. Please contact one of our sales team on 07944 508282 for more information. If you are viewing our website on a mobile device, you can click on the Telephone Icon located at the bottom of this page, or simply enter your details into our ‘Request a Quote Online Form‘ below and one of our sales team will be in touch very soon.